Long thought of as a “cushy” pastime, golf actually causes an alarmingly high number of injuries. During the golf swing, our muscles, tendons, ligaments, and joints are stressed to near full capacity as we accelerate the golf club head to nearly one hundred miles per hour in less than half a second. In fact, the injury rate for recreational golfers is an astounding sixty percent—and even higher for golfers over age fifty. And while the typical golf-related injury won’t put you in the hospital, it will result in an average of five weeks lost playing time—and some golf injuries can be season ending. Golf injuries among amateurs are caused by a combination of factors, including overuse (excessive play or repetitive practice), poor conditioning, faulty swing technique, and improper warm-up. Who warms up before playing golf? 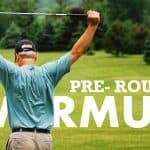 Unfortunately, most recreational golfers think that the first three holes of their round is the warm-up! Studies that only a few percent of recreational golfers take the time to stretch or warm up before playing a round or visiting the driving range. There rest of us? Well, a quick stretch here and one or two air swings and—wham—we’re off to the races. Big mistake. Most folks wouldn’t dream of standing on a pitching mound and throwing a baseball as hard as they could, or running a fifty-yard dash without stretching or warming up first. 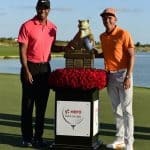 So why do we think we can waltz up to the tee box and swing like Tiger without preparing our bodies for the task with a few minutes of warming up? Any serious athlete—professional and low-handicap golfers included—knows that there is a direct link between a good warm-up and injury prevention. Time. In order to get into the habit of warming up before golfing, you must first allow yourself the time to do it. Get into the habit of leaving the house or the office twenty minutes or so earlier than you are accustomed. By avoiding that rushed feeling, you can spend time preparing to be both mentally and physically ready to play. Aerobic exercise. Once at the course, you should start with a five-minute aerobic “sweat breaker”. Briskly walking around the parking lot, jogging, running in place, or jumping jacks (my favorite because it gets the shoulders going as well) will all suffice. Remember to choose an activity that is appropriate for your age and level of conditioning. If you have any questions, consult your doctor first. Breaking a light sweat is a sign that our muscles are sufficiently warm to beginning the next step of the warm-up. Stretching. I prefer a “head-to-toe” approach to stretching, because it provides me a way to remember to include all the major muscle groups in sequence (there are lots of “golf muscles!). Hold each stretch for fifteen to twenty seconds, and avoid stretching beyond the point of pain. Stretch one side of the body, then the other. Repeat the stretches three or four times for each side. Illustrations of specific stretches are available in Dr. Divot’s Guide to Golf Injuries—A Handbook for Golf Injury Prevention and Treatment. 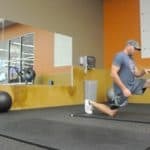 While few of us will ever play like the pros, paying attention to proper stretching and warm-up techniques—just like the pros do—will prepare our bodies for the rigors of the game, improve our performance, and help prevent nagging injuries. It only takes a few minutes and will be time well spent, I promise.